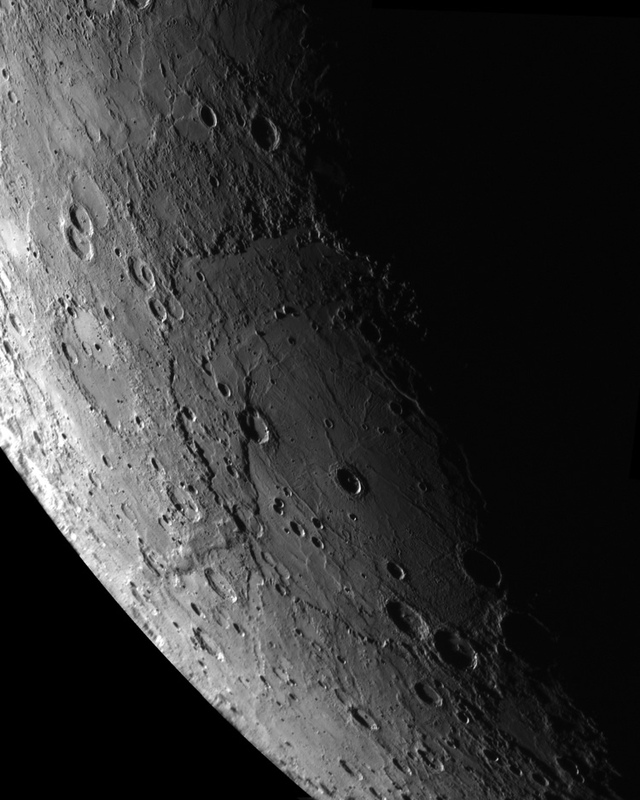 Explanation: Why do portions of this huge crater on Mercury have so much iron? The unusual Rembrandt impact basin was discovered recently in images taken during the robotic MESSENGER spacecraft's 2008 October flyby of the Solar System's innermost planet. The unusual Rembrandt spans over 700 kilometers and at 4 billion years old is possibly the youngest large impact basin on the planet. Multicolored images of the crater floor, however, indicate reflections from areas containing unusually high amounts of iron and titanium. These elements indicate that some exposed materials have not been covered by more recent lava floes, and so might originate from an epoch of Mercury's formation. Data from Rembrandt and across Mercury are now being interpreted as indicating a relatively active and volcanic past for Mercury that includes surface tectonics. Close inspection of the above image will reveal rings of Mercury's Rembrandt impact basin circling around the image center. Mercury's limb is visible on the upper left, high cliffs and small craters are visible inside Rembrandt, and the terminator between night and day runs diagonally through the image. MESSENGER is on track to fly past Mercury again this September and enter orbit around Mercury in 2011.